The majority of gangster themes in online slots are based around mafia activities and the crimes that they perpetrated. They will be loosely based on a story about a famous or infamous mafia gangster such as Al Capone or John Dillinger. There are all the old favourite characters represented. The gangster, the honest cop and the gangsters’ moll all make appearances. There are sacks of loot and newspaper headlines outlining the atrocities performed by the gangster. Usually, the audio track will be taken from the jazz era – 1920’s America. Such atmosphere also resembles poker rooms of the beginning of last century. Some online poker rooms use this stylistics in order to attract new players while others (such as http://www.888poker.co.uk) prefer modern high-tech style. The majority of gangster themed slots that are offered in online casinos have all the bonuses that players have come to expect. They include access to bonus features, wilds and scatters. This is a 3D video slot that was developed by BetSoft Gaming. Slot Father is a five reel game that has a thirty chance pay-line. By assisting the Slot Father, the rewards can be high. There are bank raids and a special bonus game featuring a machine gun battle. The game also offers free spins. In the free spins section of the game, the lucky player can multiply their free spins won by up to a maximum of three hundred times. Reel Gangsters is based around Al Capone and his escapades around organized crime. He is accompanied by his mob. The game is a five reel game. The player has the possibility to win on twenty pay-lines. There are both wilds and scatters included in the game. The bonus game is divided into five different levels, and each level is a separate mission. The whole bonus package is aptly named Daylight Robbery. The task that the player is faced with is to open Al’s safe and take the cash. If the player succeeds, then there is a high financial reward. The Godfather was developed around the story of the money spinning film of the same name. The game was developed by Party Gaming. As any player would expect there are remarkable special effects and the graphics are breath-taking. There is a highly atmospheric audio track to accompany the action. The object of the game is for the player to become the head of the Corleone family. The game is littered the wilds and scatters to help the player in their task. There are also free spin games and the Godfather bonus game. 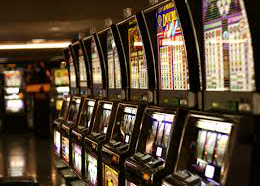 This game has a special feature which is that it offers four progressive random jackpots.